Zoos offer a variety of positions depending on an individual’s interest and experience. What unites all zoo employees, regardless of their position, is that they are passionately committed to the animals under their care and to the conservation of wildlife and wild spaces. As with all animal wildlife careers, it is best to continually expand your knowledge and understanding about animals and the habitats in which they live. Study natural sciences such as biology, zoology and ecology and participate in programs offered by local nature centers, museums and zoos. To learn more about zoo careers, explore the zoo career information webpages or attend a Zoo Boise career program where you will have the opportunity to hear directly from zoo professionals. Due to the volume of requests, Zoo Boise does not offer interview options to students at this time, but we’re now offering zookeeper career shadow opportunities. We invite you to take advantage of the information and program options related to zoo careers below. To operate a zoo and fulfill its conservation mission, zoos require a many types of jobs and employ people from a variety of different backgrounds, talents, skills, experiences and education. To learn more, visit the Association of Zoos & Aquariums Zoo Careers page at https://www.aza.org/careers-zoos-aquariums/. For City of Boise jobs, please visit their website. A zookeeper does much more than “scoop poop” and feed animals! They also conduct animal observations, keep detailed animal care records, create and provide enrichment to the animals, manage animal care volunteers, conduct educational presentations and participate in wildlife conservation projects. How do I become a zookeeper? At least an Associate’s degree in animal science, biology, zoology, wildlife resources, wildlife conservation or related field of study. Experience in animal care through volunteering or internships. Volunteering at places such as zoos and aquariums, wildlife refuges, nature centers, animal shelters and animal boarding facilities will provide opportunities for animal care experience. Experience in animal care as a paid seasonal/part-time zookeeper or animal care-taker. Willingness to relocate, sometimes long distances. To gain the necessary animal care experience, it is advantageous to take job or internship opportunities as they become available, regardless of how far or how close they are to your place of residence. Public relations, customer service, or public speaking skills. Zoos are great places for visitors to learn about animals and participate in wildlife conservation. 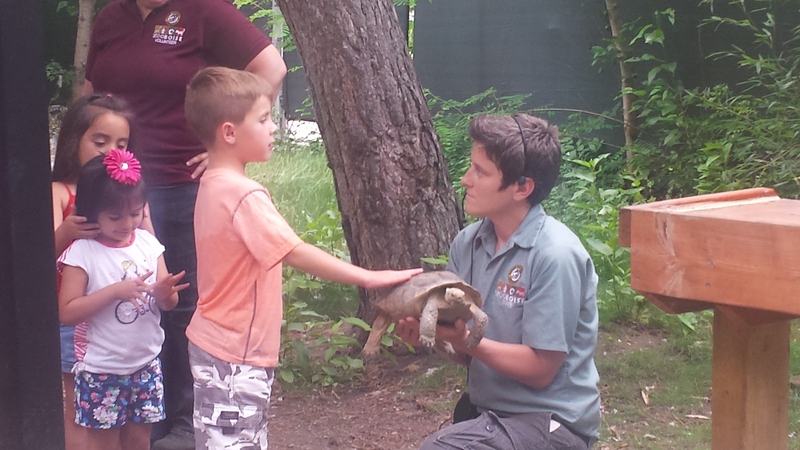 Keepers play an essential role in visitor education by providing both formal and information presentations to zoo visitors so excellent communication skills are very beneficial to a zookeeper. What is the salary range of a zookeeper? In 2014, salary for full-time zookeepers ranged from $18,000 to $40,000 per year. Factors that influence zookeeper salaries include years of experience, geographic location, size of zoo, and current economic conditions. How can I find out more information about zookeeper careers? Can I shadow a zookeeper? Yes, through the Zookeeper Career Shadow program. Please see that section below. What Zoo Career Development opportunities are available? Can I volunteer with a zookeeper at Zoo Boise? Zookeeper volunteer positions are available for qualified applicants that are a minimum of 18 years of age. For more information, click here. Are zookeeper internships available at Zoo Boise? Yes! For more information, visit Zoo Boise’s Internships page. If I volunteer, will I eventually be hired at Zoo Boise? While some Zoo Boise employees have been Zoo Boise volunteers, the majority of the employees have been hired because of the diversity of experiences and knowledge that they have gained from organizations similar to and other than Zoo Boise. How can I apply for a job at Zoo Boise? Visit the following websites for position openings at Zoo Boise. On the path to a zoo or wildlife career? Hands-on experience is essential to building the necessary skills and knowledge required to become a zoo or wildlife professional. One way to gain experience and explore zoo career options is through the ZooTeen Program open to students ages 13-17. For more information please visit our ZooTeen Program page. “How can I get a job at a zoo?” is a frequently heard question at Zoo Boise. There are a variety of positions required to successfully operate a zoo in order to fulfill its wildlife conservation and recreation mission. Many of these positions require volunteer experience at a zoo or animal-related organization. For more information about volunteer positions at Zoo Boise, please visit our volunteer page. In addition to academic knowledge and achievement, direct and practical experience is essential in achieving a zoo career. Zoo Boise offers internship opportunities in a variety of fields. If you are interested in an internship at Zoo Boise, please visit our internship page. Minimum age 13 and in 8th grade. If under 18, parent/guardian written permission. Permission forms will be provided once a Career Shadow Date is confirmed. Enthusiasm for career exploration, zoos, and wildlife conservation! There is no cost to participate in Zoo Boise Career Shadows. You are invited to join us in the care of animals by donating to the Zoo Boise Conservation Fund (https://zooboise.org/conservation/) to help towards the conservation of wild animals or to the Zoo Boise Animal Enrichment Fund to purchase special toy and other engagement items provided to the zoo animals. Once a Career Shadow date has been confirmed, an information packet will be sent with this information. Must be requested at a minimum two weeks (14 days) in advance. Please note that requests are not considered a confirmed Shadow date. If a date is confirmed, participant will receive email confirmation and information packet. Please complete the request form below and you will receive a response in 5 business days (Mon-Fri, 8am-5pm). Why are you interested in a zoo career? Would you like to receive periodic news and event updates from Zoo Boise? We promise not to trade, share, sell, or re-distribute your e-mail address.